Born in Vienna in 1881, Austrian-Jewish writer Stefan Zweig was one of Europe’s most popular and most-translated writers until the Nazis forced him and countless others into exile in the 1930s. Dozens of stories, novellas, plays, essays, feuilletons as well as a novel and an autobiography poured forth from his prolific typewriter until the day he completed his last novella while residing in the town of Petropolis, Brazil. The next day, February 23, 1942, having safely mailed the typescript to his agent, he and his wife committed suicide. While few modern readers can name any of Zweig’s works, the Germans thought them important or dangerous enough to burn, along with works by many other Jews. Fortunately, Zweig’s reputation seems to be undergoing a revival of late. At least two American presses are bringing out new translations of some of his works and a biography, Three Lives by Oliver Matuschek, was published to warm reviews in 2012. Further, film director Wes Anderson cited Zweig’s writing, particularly his autobiographical memoir The World of Yesterday, as the inspiration behind his recent popular feature film, The Grand Budapest Hotel. 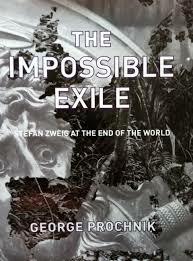 Renewed interest in Zweig is also being generated by George Prochnik’s The Impossible Exile: Stefan Zweig at the End of the World, an artful and perceptive study of Zweig’s years of exile from 1935 until his fateful end. After leaving Austria, Zweig felt he had lost his language and cultural bearings; feeling adrift and homeless, certain he would be forgotten, he fell into an irreversible spiritual decline. Unlike the many celebrated exiles who take root and flourish in the new ground into which they have been planted, he was a sad example of those who cannot rise to the enormous challenge of exile, who are “like fruit that had been ripped too soon from the tree, not ripe, but dry and bitter,” as novelist Lion Feuchtwanger once put it. Mann (who was not Jewish) and many of Zweig’s fellow Jewish exiles had long felt exasperated at Zweig’s unwillingness to condemn the Nazis. A secular Jew who equally rejected Zionism despite the persuasions of his friend Theodor Herzl, Zweig had an internationalist and humanist creed; he was a pacifist and a conciliator along the lines of a Neville Chamberlain. Unable to imagine an uneducated “beer-hall agitator” as anything but a temporary threat, he preached understanding and urged his fellow emigres not to criticize the newly-fashioned Reich for fear of provoking it to further outrages. 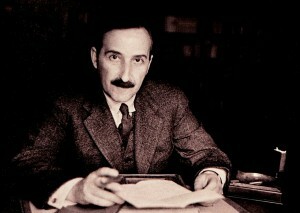 Zweig’s pacifism was apparent in an early antiwar drama written after WWI, based on the life of the Biblical prophet Jeremiah, in which Jeremiah urges the Jews of ancient Jerusalem to make peace with the besieging Chaldeans. It was an idea already made topical in British playwright Israel Zangwill’s 1908 play The Melting Pot, in which Jewish-American immigrants who have survived a bloody pogrom are urged to forgive the perpetrators — to “turn the other cheek,” so to speak — for the sake of future generations. Zweig’s exile began in 1934, the day the police knocked on his door, demanding to search his home for weapons. He quickly left for London and stayed there until England declared war on Germany and branded him an “enemy alien.” Then his peripatetic trail led him to New York, Ossining and Brazil. His novella Chess Story, completed the day before his suicide, is regarded as one of his best. The story focuses on a group of men playing chess against a chess master on board an ocean liner bound for South America. A stranger proves a superlative challenger and reveals he had taught himself to play chess with (or against) himself, splitting his mind down the middle, while in solitary confinement; the story is a portrait of mental disintegration. His one novel, Beware of Pity (1938) was a dark psychological novel of manners set in the Habsburg Empire on the verge of its collapse.